We are a leading Manufacturer of platform flat belt conveyor, sorting line conveyor, ptfe teflon belt conveyor, cooling tunnel conveyor and wire mesh conveyor from Pune, India. 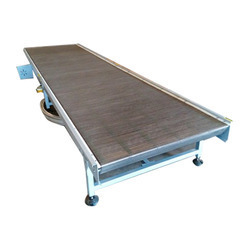 Catering to the requirements of several industries, we offer Platform Flat Belt Conveyor. Ideal to be used for heavy duty applications, these conveyors offer high performance, easy operations and excellent durability. 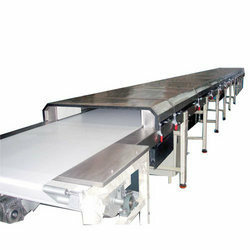 Further, we also quality test these conveyors at various production stages to deliver the clients zero defect products. 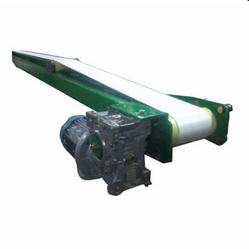 Type of Conveyor Powered roller conveyor, 90 degree bend powered roller conveyor. 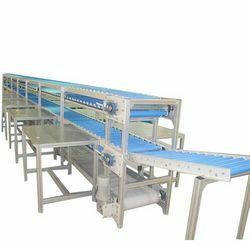 Our range of Sorting Line Conveyor are specially designed to meet the applications of food, packaging and various other industries. Fabricated with utmost precision, these are acknowledged for rugged construction and easy operation maintenance. These are tested by our quality analysts on various parameters to make sure that only a flawless and qualitative range reaches to the clients. Further, we also provide these line conveyors on turnkey basis to our clients. We offer our clients PTFE Teflon Belt Conveyor that are precision manufactured using quality checked material. These conveyors are ideal for bulk material handling applications in various industries such as automotive, warehouses etc. Our range is known for rugged construction, durable performance and easy operation. Further, we also have facility to provide these conveyors on turnkey basis to our clients. Supported by our experienced personnel, we are manufacturing and supplying Cooling Tunnel Conveyor that are suitable for bulk material handling in various industries. Precision manufactured using advanced technology, these offer high performance, easy operation and long service life. Our range is available in multitude of dimensions and shapes to suit the varied application needs of the clients. 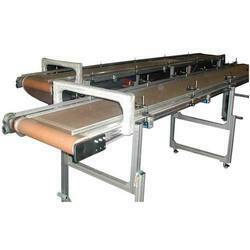 Further, we also offer these conveyors with additional accessories as desired by the clients. We are trusted manufacturers and suppliers of Wire Mesh Conveyor that are fabricated using finest grades of stainless steel. Easy to operate and maintain, these conveyors come in multitude of dimensions and shapes with accessories. Renowned for robust construction and effective conveying of bulk material, these find wide application in automotive, food and packaging industries. We offer these conveyors at industry leading prices. Looking for Bulk Handling Equipment ?